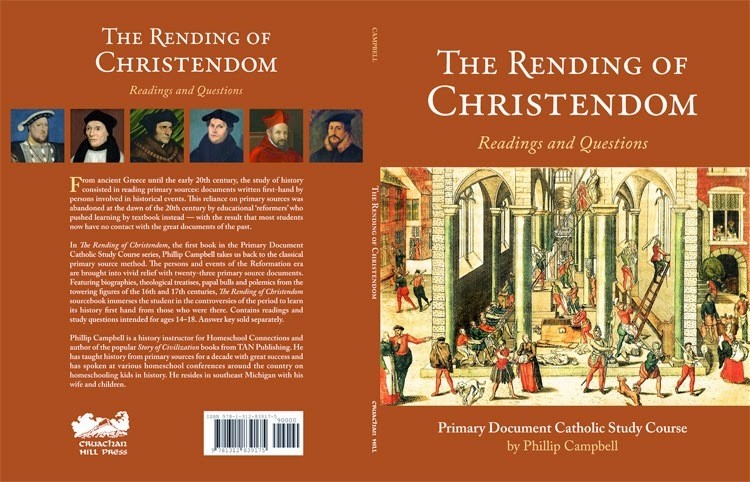 My friend Phillip Campbell, a history teacher for Homeschool Connections, has created an excellent high-school level course on the Reformation/Counter-Reformation era based on primary source documents. The book is designed to follow the online course, but it can certainly stand alone as it's own curriculum. I'm about halfway through, and I think the selection of readings provides a very broad and thorough understanding of the key players and events without being overwhelming. I took a church history elective class at my secular university, and I have to say that reading actual primary sources like these acted as an antidote to my high school history textbooks and marked the beginning of my conversion process from Protestantism to Catholicism. If I know you in real life, I'd be happy to show you my copy. I don't profit at all from sales of this book, I just think it's a really great idea and worth promoting.